I grew up loving Mister Rogers’ Neighborhood, said journalist Anthony Breznican. But it wasn’t until I had a chance encounter with Fred Rogers as an adult that I realized the character he played on TV wasn’t fake. I WAS PUTTING my 4-year-old son to bed one night this past May and scrolling through the news in the dark, finding only more darkness beyond. The horror and heartbreak of the bombing in Manchester, England, were unfolding. Amid the fear and uncertainty, I saw countless instances of selflessness and unity—people welcoming strangers into their homes, taxi drivers helping families get away from the scene, families reaching out to find loved ones who hadn’t answered their phones (often finding them scared but safe). Some wonder if he really said this. Often quotes online that seem too perfect to be true are exactly that. But no, Mr. Rogers really said it. He said it often. Then I scrolled a little further and found this tweet. On this day in 1967, a show featuring a kindly man in a cardigan & blue sneakers debuted on public television— #MisterRogersNeighborhood. But that notion of 50 years hit me hard. And it stirred up a memory of him from long ago. 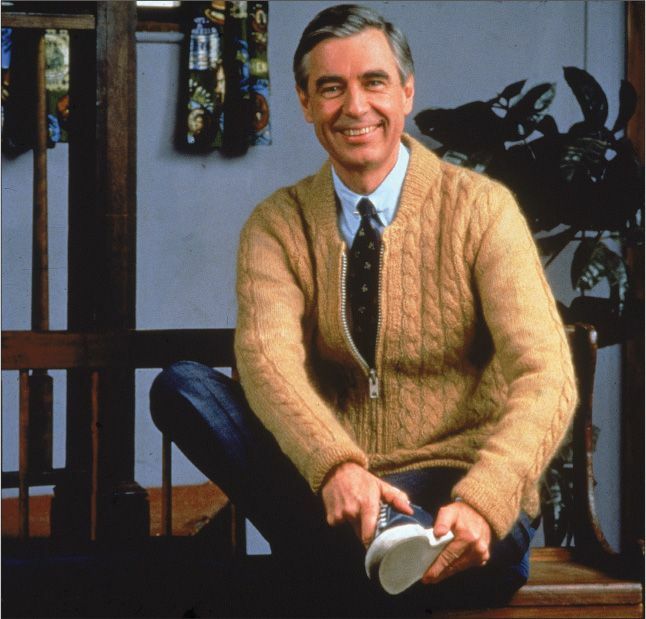 Fred Rogers was from Pittsburgh, my hometown, and I’m a member of just one generation that grew up loving this man, who taught us to be kind above all and see ourselves as special and good, no matter what the world tried to tell us to the contrary. 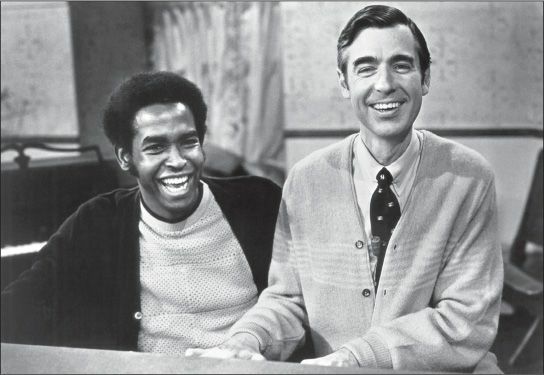 When I got older, I learned firsthand that Fred Rogers was the real thing. That gentle soul? It was no act. Mister Rogers’ Neighborhood ran until 2001, but I lost touch with it as I got older. That’s how it goes. But in college, one day, I rediscovered it, just when I needed it. I was having a hard time then. The future seemed hopeless. I was struggling, lonely, dealing with a lot of broken pieces within myself, and not adjusting well. I was a student at the University of Pittsburgh but felt rudderless. I wanted to be a writer but received nothing but discouragement from home. Nevertheless, I devoted everything I had to the school paper, The Pitt News, hoping that would propel me into some kind of worthwhile career and future. It seemed just as likely that I’d fall on my face and end up nowhere. It feels silly to say—it felt silly then—but I stood mesmerized. His show felt like a cool hand on a hot head. I never sat down, but I watched the whole thing. Afterward, I left feeling... better. SEVERAL DAYS LATER, I got in the elevator at the paper to ride down to the lobby of the William Pitt Union. The doors opened, and who was standing there but Mr. Rogers. For real. I thought I was hallucinating for a moment. But there he stood—a slim, old man in a big coat and scarf, eyes twinkling behind his glasses, a small case clasped between his hands in front of him. I stepped aboard the elevator, staring, and he nodded at me. I nodded back. I think. Chances are, he could sense a geek-out coming. But I kept it together. Almost. We rode down in silence, and when the doors opened, he let me go out first. Thinking back, there were maybe two others in the elevator with him. University people, perhaps, seeing him out from whatever meeting they’d had. He smiled patiently. I imagine this sort of thing happened to him about every 10 feet. Then he said: “Did you grow up as one of my television neighbors?” I felt like crying. Yeah. I did. I was his neighbor. I got to hug Mr. Rogers, y’all! I pulled it together. Then we were walking out and making small talk. He asked if I was a student at the university, and what I was studying. I mentioned being a big fan of Johnny Costa, who was the piano player on his show. When you get older, you learn to appreciate things like the gorgeous jazz that this old children’s TV show featured. Costa, as it turned out, would pass away just a few months later, and we talked about him as we walked, and how Mr. Rogers marveled at the speed of his improvisations on the keys. So I sat. And I told him the truth. I told him my grandfather had just died. He was one of the few good things I had. I felt adrift. Brokenhearted. On top of everything else. This was just too much. I guess Pap had been my version of a “helper” in hard times, and I was still looking for him, even though I knew he was gone. I like to think I didn’t go on and on, but pretty soon Mr. Rogers was telling me about his grandfather—and a small boat the old man bought for him when he was a young man. Mr. Rogers asked how long ago Pap had died. It wasn’t long, and I was still torn apart. His grandfather had obviously been gone for decades. Now that 21 years have passed since then, I know that pain of losing someone so special shifts to the background, but never really goes away. Mr. Rogers also still missed his grandfather, still wished he was there when he needed him. “You’ll never stop missing the people you love,” Mr. Rogers told me. His grandfather had given him the rowboat as a reward for something. I forget what. Grades, or graduation. Something important. Something he’d worked hard to accomplish. He didn’t have either now, his grandfather or the boat, but he had that work ethic, that knowledge and perseverance the old man encouraged with his gift. “Those things never go away,” Mr. Rogers said. I’m sure my eyes looked like stewed tomatoes. How long did that encounter last, maybe five minutes? Mr. Rogers was there for me then. But really, he’s here for you now, for anyone who needs him. I never saw him again after that. But that “helper” quote? That’s authentic. That’s who he was. Mr. Rogers was for real. Over the years, I’ve learned a lot about the man he was. Some of it was surprising. I never realized when I was little that when Mr. Rogers sat with his feet in the cool water of a pool and invited the singing cop, Officer Clemmons, to join him that that was a daring statement about equality. It seemed like no big deal to me. I suppose now that was the point. A white man and a black man, chilling out on a hot day with their feet in the water—so simple, such a little thing, but brave in its sweetness. I look back at the way he connected to a little quadriplegic boy named Jeff Erlanger not by ignoring his disability, but by actively asking him about his electric wheelchair and all the things the boy could do with it. Mr. Rogers saw people. He saw through and around the things that confuse or distract others. He saw these people. He saw me, a struggling young man who needed some kind words. And somehow, in a way that defies belief, he made you believe he saw you, too—even if you had never met. His television neighbor. The wonderful news is, he’s still here. He’s still with us, now more than ever, since the live-streaming platform Twitch is playing all of his old shows, hopefully for a new generation to discover. About seven years after I crossed paths with him in Pittsburgh, I was living in Los Angeles, working as a reporter at the Associated Press. I was married, I had found that dream job. Things were better. One morning, in February 2003, I logged in to read the news and saw that Fred Rogers had died. He was only 74. I sat at my computer with tears in my eyes. But I wasn’t crying over the death of a celebrity. I was mourning the loss of my neighbor.